Emily steelhead fishing on the Grande Ronde River in November. Photo by Kyle Bratcher. Now that 2018 is here, anglers are reminded they are once allowed to harvest three hatchery summer steelhead per day in the Snake, Grande Ronde, and Imnaha Rivers, consistent with permanently-adopted regulations. Bag limits had been reduced during the fall through a series of temporary regulations as fish managers implemented conservative management actions for historically-low Columbia River steelhead run in 2017. The steelhead season began Sept. 1 with a one fish limit in Oregon tributaries, including catch-and-release only in the Snake River. Bag limits were increased to two hatchery steelhead per day in the Snake River and tributaries on Oct. 21 when forecasted returns exceeded expectations. The temporary regulations were allowed to expire on Dec. 31, thus reinstating the permanent bag limit. Typically, about 65 percent of Oregon’s Snake River steelhead survive the migration between Bonneville and Lower Granite Dams but in 2017, over 70 percent survived the journey. Yanke estimates that approximately 1,500 Grande Ronde and 800 Imnaha steelhead will be surplus to production needs, after broodstock collection goals are met. “Now that our steelhead are closer to home, we can be more certain that further restricting angler harvest isn’t necessary,” Yanke said. Increasing bag limits isn’t just about putting more fish in the freezer, Yanke explained, but is also an important conservation tool for wild steelhead populations. “Unharvested hatchery steelhead can miss their intended destination at hatchery facilities, straying into nearby streams and spawning with wild steelhead,” Yanke said. “Harvest is a tool we use to reduce that risk while achieving the harvest objectives of our programs.” Spring fisheries are important components of the Grande Ronde and Imnaha Rivers, representing 60-80 percent of the hatchery steelhead harvested annually. 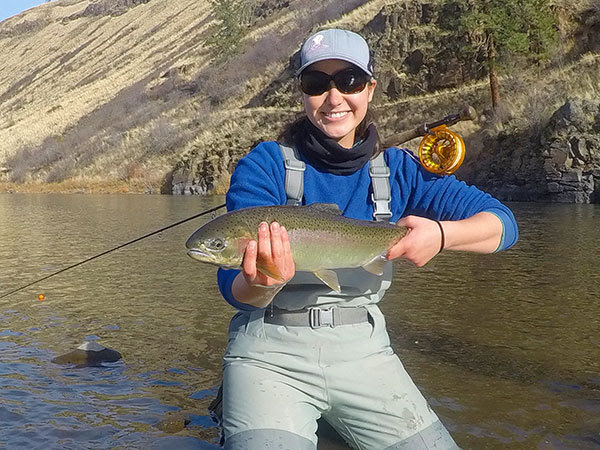 While mangers are encouraging anglers to take full advantage of the reinstated harvest opportunity, caution is advised to handle any wild steelhead encountered with care. “Wild steelhead populations, like their hatchery cousins, are also returning at very low levels,” said Yanke. Anglers who catch a wild fish should use proper catch-and-release principles to ensure it arrives on the spawning grounds in perfect condition. “This year, more than most others, each fish counts for the future,” said Yanke.